When you need more low-frequency output and punch than a full-range speaker can deliver on its own, pair it with Truesonic 2 series subwoofers. The frequency range and crossovers of the Truesonic TS212S, TS215S, and TS218S have been tuned to provide smooth, low-end sound production in the 35Hz-100Hz range (42Hz-100Hz for the TS212S). The extended, powerful bass response will dramatically enhance the overall impact of the music you’re playing. They also offer XLR+1/4” stereo inputs, balanced XLR outputs, and are housed in compact, internally-braced plywood cabinets with durable metal recessed-handles for easy transport. When you’re ready to extend the frequency range of your live performance reinforcement, Truesonic subwoofers are the effective, economical, and professional choice. These are class-leading subwoofers and worthy of the Truesonic 2 name. The Truesonic TS212S, TS215S, and TS218S offer a massive 12”, 15”, or 18” low-frequency driver, respectively. They’re each rated at a whopping 1250 watts and feature a 3” voice coil, which means you’ll always have plenty of low-end volume when you need it most. What is included with the TS212S? The Frequency Response for the TS212S is 42–100 Hz (-10 dB). 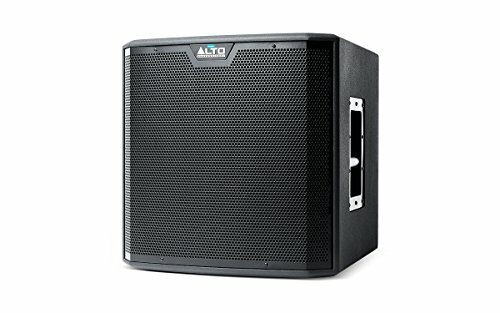 How powerful is the TS212S? The TS212S comes with a 12” Powered Subwoofer with a 3” voice coil. It pumps 1250 watts of peak power and 625 watts of continuous power. Does the TS212S have Bluetooth? The TS212S does not have Bluetooth. What connectors are on the TS212S?